Hardy sea workhorse beautifully reproduced. Blade 26.5cm with wide shallow fuller. 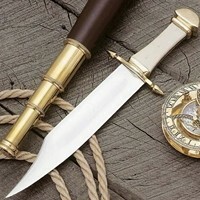 Handle scales are camel bone with brass furniture.